Spring 2005; 8" Chenille fur rabbit with poly filling; One of Boyds most popular series ever! Based on the Headbean's actual family. Emily is an 8"H jointed gold chenille bunny dressed in a ..
Spring 2005; 8" Chenille fur rabbit with poly filling; One of Boyds most popular series ever! Based on the Headbean's actual family. 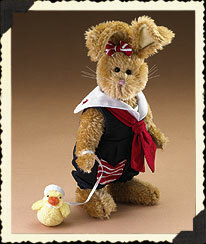 Emily is an 8"H jointed gold chenille bunny dressed in a nautical romper with a fuzzy lil' duck friend. Emily coordinates with the Boyds Ahoy! Fashion family.